1746 ~ 1755: born in Edo. He starts his career very early, performing under the name of Yoneyama Tokugorô in Edo koshibai theaters. Fall 1755: Tokugorô becomes disciple of the actor Ôtani Hiroji II, who gives him the name of Ôtani Haruji I. 6th lunar month of 1757: his master Ôtani Hiroji II dies. 11th lunar month of 1758: Ôtani Haruji I takes the name of Ôtani Oniji II at the Ichimuraza, during the kaomise program "Kaomise Sajikigadake". 9th lunar month of 1759: Oniji plays in the same theater the aragoto role of the yakko Yokanpei in the drama "Ashiya Dôman Ôuchi Kagami", which celebrates the departure of Nakamura Tomijûrô I to the Kamigata. 1st lunar month of 1762: Oniji's rank in the Edo hyôbanki, tachiyaku section, is jô-jô (superior - superior). 11th lunar month of 1762: Ôtani Oniji II takes the name of Ôtani Hiroji III at the Ichimuraza, playing in the kaomise drama "Kisoe Uta Sakae Komachi". 9th lunar month of 1766: Hiroji plays at the Ichimuraza the roles of En'ya Hangan and Amagawaya Gihei in the drama "Kanadehon Chûshingura". The role of Ôboshi Yuranosuke is played by Onoe Kikugorô I. 11th lunar month of 1766: Hiroji plays at the Ichimuraza the role of Watanabe Minbu in the kaomise drama "Higashiyama Dono Kabuki no Tsuitachi". 1st lunar month of 1767: Hiroji plays in the same theater the roles of Kurofune Chûemon and Danzaburô in the new year drama "Soga Yawaragi Soga". 2nd lunar month of 1767: first Kabuki adaptation, at the Ichimuraza, of Chikamatsu Hanji's puppet theater drama "Taiheiki Chûshin Kôshaku"; Hiroji plays the role of Yazama Jûtarô [casting]. 7th lunar month of 1767: Hiroji plays at the Ichimuraza the role of Kokingo in the drama "Yoshitsune Senbon Zakura". 8th lunar month of 1768: Hiroji plays at the Ichimuraza the role of Terukuni in the drama "Sugawara Denju Tenarai Kagami". 5th lunar month of 1769: Hiroji plays at the Ichimuraza the roles of Hayano Kanpei and Amagawaya Gihei in the drama "Kanadehon Chûshingura"; the roles of Okaru and Yuranosuke are played by Nakamura Matsue I and Sawamura Sôjûrô II. 1st lunar month of 1772: Hiroji plays at the Ichimuraza the role of Matsuômaru in the drama "Sugawara Denju Tenarai Kagami"; the roles of Umeômaru, Sakuramaru and Matsuômaru's wife Chiyo are played by Bandô Matatarô IV, Arashi Sangorô II and Azuma Tôzô II. 9th lunar month of 1773: Hiroji plays at the Ichimuraza the roles of Momonoi Wakasanosuke and Teraoka Heiemon in the drama "Kanadehon Chûshingura"; the roles of En'ya Hangan, Okaru and Yuranosuke are played by Ichikawa Danzaburô III, Nakamura Rikô I and Onoe Kikugorô I. 7th lunar month of 1774: Hiroji plays at the Nakamuraza the roles of Ôboshi Yuranosuke [print] and Takebe Genzô in the dramas "Kanadehon Chûshingura" and "Sugawara Denju Tenarai Kagami". Summer 1777: the book "Yakusha Sensakuron" ("About actors prying") is published in Edo. It gives some private information on actors. Edo readers learn that Hiroji lives with his spouse Orise and his adopted sons in the district of Yoshi-Chô and his annual salary is 700 ryô. 8th lunar month of 1777: Hiroji plays at the Nakamuraza the role of Igami no Gonta in the "Sushiya" scene of the drama "Yoshitsune Senbon Zakura"; the roles of Yazaemon, Yasuke and Osato are played by Ichikawa Danzô IV, Arashi Sangorô II and Yoshizawa Iroha I. 1780: tour in the Echigo province with the actors Matsumoto Kôshirô IV and Ichikawa Yaozô III. 6th lunar month of 1783: Hiroji plays at the Ichimuraza the roles of Teraoka Heiemon and Amagawaya Gihei in the drama "Kanadehon Chûshingura"; the roles of Okaru, Yuranosuke and Gihei's wife Osono are played by Matsumoto Kôshirô IV, Nakamura Rikô I and Azuma Tôzô III. 7th lunar month of 1784: Hiroji plays at the Nakamuraza the role of Yazaemon in the "Sushiya" scene of the drama "Yoshitsune Senbon Zakura"; the roles of Yasuke and Osato are played by Ichikawa Yaozô III and Iwai Hanshirô IV. 5th lunar month of 1787: Hiroji plays at the Nakamuraza the roles of Ishidô Umanojô and Hayano Kanpei in the drama "Kanadehon Chûshingura". 11th lunar month of 1788: Hiroji plays at the Nakamuraza the role of Sannigorobê in Sakurada Jisuke I's kaomise drama "Tôzumô Hana no Edokata", which celebrates the return in Edo of the actor Nakamura Nakazô I. 1st lunar month of 1789: Hiroji's rank in the Edo hyôbanki, tachiyaku section, is jô-jô-kichi (superior - superior - excellent). 8th lunar month of 1790: Hiroji plays at the Ichimuraza the roles of Kakogawa Honzô and Amagawaya Gihei in the drama "Kanadehon Chûshingura"; the roles of Yuranosuke, Honzô's wife Tonase and Gihei's wife Osono are played by Sawamura Sôjûrô III, Nakayama Tomisaburô I and Iwai Kiyotarô II. 9th lunar month of 1794: Hiroji plays at the Miyakoza the role of Kawagoe Shigeyori in the drama "Yoshitsune Senbon Zakura". 1st lunar month of 1795: Namiki Gohei I's drama "Godairiki Koi no Fûjime" is staged for the first time in Edo, at the Miyakoza; Hiroji plays the role of Izushi Takuzaemon [casting]. 4th lunar month of 1795: Hiroji plays at the Miyakoza the roles of Ishidô Umanojô and Horibe Yajibê in the drama "Kanadehon Chûshingura". 9th lunar month of 1796: the play "Hikosan Gongen Chikai no Sukedachi" is staged for the first time in Edo, simultaneously at the Kiriza and the Miyakoza; Hiroji plays the role of Yoshioka Ichimisai in the former theater [casting]. 5th lunar month of 1797: Hiroji plays at the Kiriza the role of Yamakawaya Gon'emon in Namiki Gohei's drama "Aigikyô Karigane Komon", a revival of "Aigikyô Karigane Gomon", written by the same playwright and staged for the first time in Ôsaka at the Kado no Shibai in the 7th lunar month of 1774. 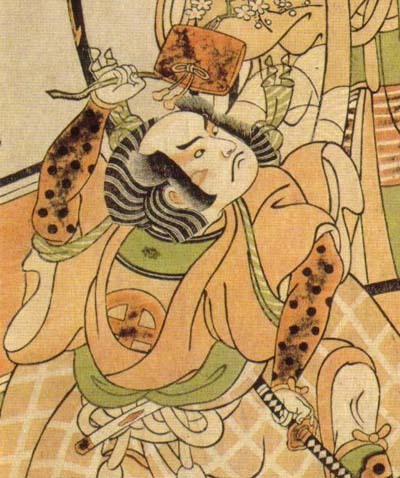 Tomoemon's stage partners are Sawamura Sôjûrô III (Karigane Bunshichi), Segawa Kikunojô III (Bunshichi's wife Otsuta, Heibei's wife Otsugi), Arashi Ryûzô II (Kaminari Shôkurô), Ichikawa Omezô I (Hotei Ichiemon), Ôtani Tomoemon II (Gokuin Sen'emon) and Nakamura Denkurô IV (Yamakawaya Gonroku). 7th lunar month of 1798: Hiroji appears on stage for the last time, at Moritaza, playing in the drama "Katsura Otoko Yaiba no Ôdachi". Ôtani Hiroji III was a talented tachiyaku, who made his career mainly in Edo theaters during the second half of the eighteenth century. "His best roles were faithful old servants and strong otokodate" (Samuel Leiter in "New Kabuki Encyclopedia").